C A R M E L M A G A Z I N E • H O L I D A Y 2 0 1 5 145 The City of Carmel-by-the-Sea is hereby declared to be primarily, essentially and pre- dominately a residential city wherein business and commerce have in the past, are now, and are pro- posed to be in the future, subordinated to its resi- dential character… During his term on the council, he took those words seriously. "I was always interested in things that supported that statement," he avers. "My motivation was always to protect and pre- serve the character and culture of Carmel-by- the-Sea. They should read that before every council meeting. It is what Carmel was and should be in the future." Around 1960 he spied "a beautiful blonde, living on Carmel Point with two little girls in tow." That was Courtney, the woman who would become the love and light of his life. The two gleefully traveled through life together, rais- ing a family, building businesses, making a home. Sadly, at 89, his beloved Courtney is suffering from Alzheimer's disease and lives in a skilled nursing facility. Brunn heads to Carmel Valley to be by her side at least once every sin- gle day. He's written a book, "Flaps Up!" full of poetry, most of which is about the abiding affec- tion he holds for his beautiful wife. Parts of the proceeds of the book are donated to the Alzeimer's Association. "So far I've raised more than $1,000 for that organization," he says. Howard Brunn has led an exemplary life, and he has no intentions whatsoever of slowing down. As for that bid for mayor, he has said that two conditions would have to be met in order for him to consider running. One is that current mayor Jason Burnett would have to announce that he would not run. The second is that City Administrator Doug Schmitz would have to agree to stay on for his entire term, if elected. "When I heard that Jason decided not to run for reelection, I talked to Doug," Brunn says. "He said he'd think about it. So, we'll see." Don't bet against him. 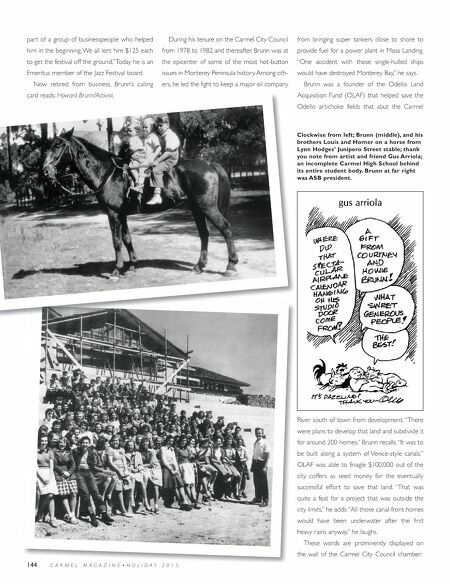 Few men become first-time published authors in their ninth decade; Brunn's "Flaps Up!" is a paean to the love of his life, Courtney. It also con- tains a gripping first person account of a WW II bombing raid over Europe. 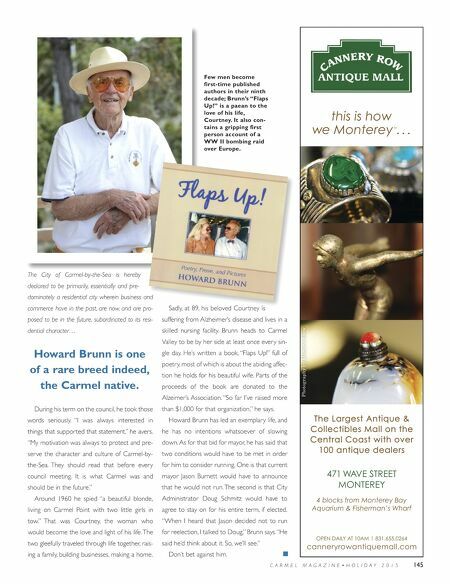 T h C i f C l b h S i h b d t e y i s Howard Brunn is one of a rare breed indeed, the Carmel native.